Repair nylon/hypalon/neoprene with this tough bonding formula. 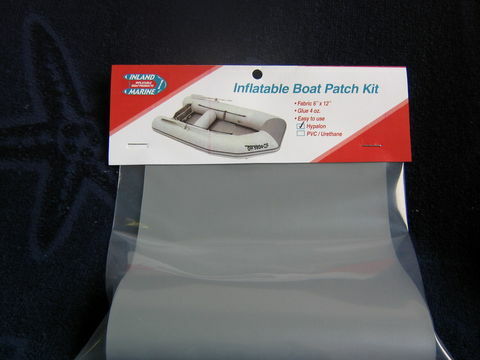 Kit includes Urethane/PVC adhesive and a 6" x 12" PVC fabric to ensure long lasting repairs on dinghies, sport boats and other inflatable craft. NOTE: If you are not sure whether your boat or raft is hypalon or Urethane/PVC, contact the manufacturer. You may also refer to our chart. In addition, typically PVC or Urethane is the same color on the inside of the material as on the outside whereas hypalon is different colors i.e. dark grey/light grey. An exception to this is red PVC or other boats colored other than grey or white shades.